Never mind the much-disputed third goal, the most famous line in English sporting commentary proves definitively that England's fourth and final goal should never have been allowed. 'Some people are on the pitch, they think it's all over... it is now.' A goal scored while a pitch invasion is underway! Actually, the BBC footage shows only three individuals encroaching on the pitch, but never mind, with no more trophies for a half-century and counting, we'll take both dodgy goals as some way to make up for all the hurt that followed. 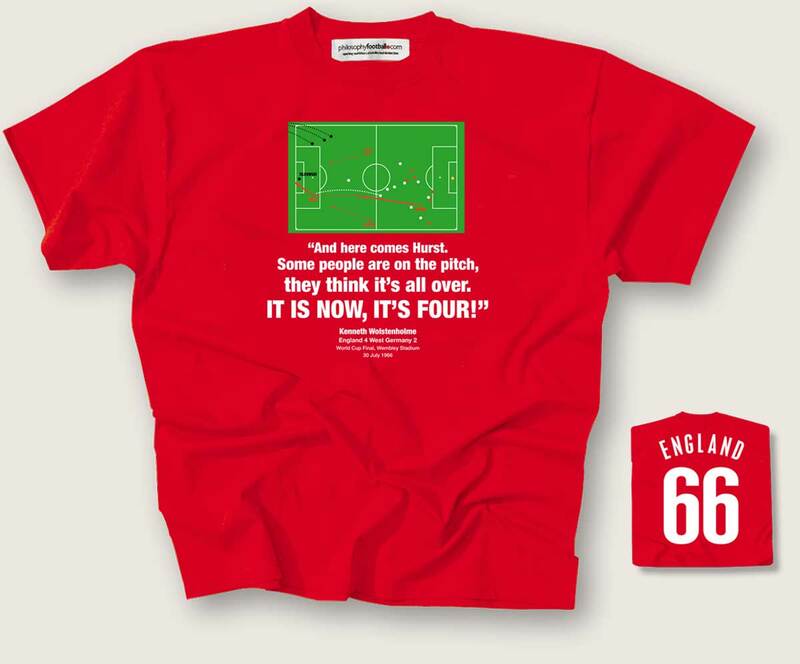 With your shirt you can purchase the new book 1966 and Not All Thatat half-price and postage free. Edited by Philosophy Football co-founder Mark Perryman, the book is full of new writing on 1966 including contributions by David Goldblatt, Simon Kuper, Amy Lawrence and Smon Inglis. 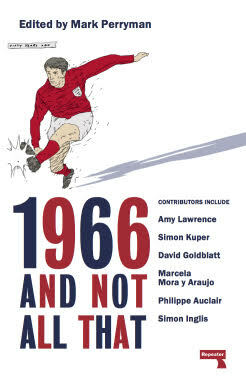 Features a first-ever oral history of 1966, and most unusually, match reports of each of England's games by present-day writers from England's opponent nations. Original and wide-rangimg, just £4.49 with your tee. Full book details, or to buy separately from here. Unisex size small (36inch chest/90cms). Available as listed in drop-down menu below. Gift-wrap service. With exclusive Philosophy Football wrappng paper and gift tag. To personalise the message on the tag type the message you would like us to add in the box provided.